Dodge Correctional Institution is a maximum security prison located in Waupun Wisconsin that opened in 1978. The facility has an operating capacity of 1,165 offenders, and a current capacity of around 1,570 adult male inmates. 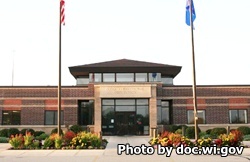 In addition to housing general population inmates this facility serves as a central reception center for all male adults in the region who have been found guilty of a crime and sentenced to prison. During reception, inmates undergo evaluations and assessments that will determine their security level and program needs, it is at this point that the inmate will be assigned to a more permanent facility. Dodge Correctional Institution also provides centralized medical services to male and female inmates in the region. Recreational activities available for inmates include basketball, soccer, track, Frisbee, softball, weightlifting, kickball, volleyball, and stationary bikes. Offenders also have access to a regular library and law library. Because this facility serves as an intake center and inmates are housed here for shorter periods of time, programs are limited. Dodge Correctional Institution provides religious worship services, re-entry counseling, and Alcoholics Anonymous group sessions. All visitors must have an approved visitation application on file before they can visit. Inmates are allowed a maximum of five visitors per visit (children under the age of five do not count towards this number). Inmates in Assessment and Evaluation are only allowed four immediate family members on their visiting list, offenders in the General Population are allowed up to 12 visitors on their visitation list. Visitors can bring up to $15 in coin into the visiting room for use in the vending machines (paper money is not allowed). Assessment and Evaluation inmates are allowed two visits per week. Visits are two hours in duration and occur on weekdays from 3pm-8:30pm and on Saturdays, Sundays and Holidays from 8:15am-3:45pm. General Population inmates are allowed three visits per week. Visits on weekdays are up to three hours in duration, and are two hours long on the weekends. Visitation occurs Monday-Friday from 3pm-8:30pm and on Saturdays, Sundays, and Holidays from 8:15am-3:45pm. Processing of visitors stops between 12pm-12:30pm on weekends, and between 5:15pm-5:45pm on weekdays to complete the inmate count. All processing of visitors ceases 45 minutes prior to the end of the visiting hours. For more information on visiting, read the Dodge Correctional Institution Visitors Guide here.